We reserve the right to vary furniture and fittings from those shown, but those supplied will be to a similar standard. The holiday cottage enjoys all the comforts of modern accommodation in a traditional Scottish setting. With full central heating, the property is equipped with a washing machine, hob, dishwasher, microwave, oven, satellite TV, DVD player, inclusive Wi-Fi broadband. We offer secure cycle and sports equipment cleaning and storage facilities. The modern bathroom has a bath with separate shower cubicle and there are two double bedrooms, both with king size beds. The open plan lounge and kitchen offer contemporary fittings along with a warming wood burner. The owners, Sally and John, live adjacent to the Byre and are always happy to help in any way they can to ensure your stay is an enjoyable one. 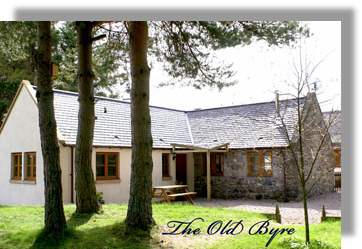 Situated in Scotland near Aberlour, known locally as “The Jewel of Speyside”, The Old Byre holiday cottage is in the heart of Malt Whisky country, indeed the world famous Malt Whisky Trail weaves right past the door. The Cairngorm National Park is only five miles to the south, with all it's walking and climbing opportunities. With open views to the surrounding Highlands of Scotland, the cottage is set within enchanting grounds. Follow the path at the end of the garden and you will find yourself on the Speyside Way; a 50 mile footpath that leads from the Moray Firth, with its beautiful beaches and fishing villages, through to the stunning Grampian Mountains and on towards the Cairngorms. Sorry, The Old Byre is not suitable for children under 15 or pets. When can I stay ?